Forsythia Not Blooming: Why Won't My Forsythia Bloom? Forsythia! They become a tangled mess if not carefully groomed, root wherever their branches touch the soil and take over your yard if you don’t beat them back. It’s enough to make a gardener swear, but we keep them all the same because nothing says spring like those bright yellow blooms. But then comes spring and nothing happens; there are no blooms on the forsythia bush. A forsythia not blooming is like Valentine’s Day without chocolate. Why won’t my forsythia bloom? 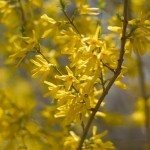 There are several reasons why a forsythia will not bloom. The simplest would be winter kill. Many older varieties of forsythia won’t bloom after a hard winter or a late spring frost. The buds are simply not hardy enough to survive. However, the most common reason for forsythia not blooming is improper pruning. Blooms are created on one year old wood. That means this year’s growth brings next year’s flowers. If you pruned your shrub in summer or fall, or you trim it to rigid dimensions, you have removed the growth that would have produced flowers. If you’re asking, “Why isn’t my forsythia blooming?”, you may also want to look at its placement in your yard. Without six hour of sunlight, your forsythia won’t bloom. As every gardener knows, a garden is an ever-changing thing and sometimes the changes happen so slowly we fail to notice. Is that once sunny corner now shaded by the maple that seems to have grown over night? If you’re still asking, “Why isn’t my forsythia blooming?,” look at what’s growing around it. Too much nitrogen will turn your shrub a full and lovely green, but your forsythia won’t bloom. If your shrub is surrounded by lawn, the high nitrogen fertilizer you use on your grass may be hindering forsythia bud production. Adding more phosphorus, like bone meal, can help offset this. After all is said and done, a forsythia that will not bloom may just be too old. You can try lopping the plant back to the ground and hope the new growth will rejuvenate the bloom, but maybe it’s time to begin again with a newer cultivar of that favorite herald of spring: forsythia.